Versatile and easy to use, the Model APS2200 gives you the power to make the weighing system an integral component of your day to day operation. Standard software features such as programmable data communication, product grading, peak hold, multiple ID numbers, accumulator, and counter, give you the power to effectively manage and monitor your manufacturing process. 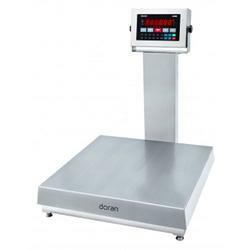 The 2200 combines the legendary Doran quality and durability with the advanced features you demand in your fast paced weighing operations. From the user-friendly keypad to the robust software features, the Model 2200 Advanced Weight Indicator provides leading edge technology for a variety of applications. Versatile and easy to use, the Model 2200 gives you the power to make the weighing system an integral component of your day to day operation. Standard software features such as programmable data communication, product grading, peak hold, multiple ID numbers, accumulator, and counter, give you the power to effectively manage and monitor your manufacturing process. Connect, control, and communicate to any device or computer with the two standard RS-232 ports, eight standard outputs, two standard inputs, or a wide range of communication options. Connect with our wired Ethernet, Wireless Ethernet, Modbus/TCP, USB, 4-20mA, RS-485 or Fiber Optic options. Control your process with our optional relays that can be mounted inside the enclosure to provide a turnkey solution. Communicate with the flexible and user definable data strings to include tare, product ID and time and date. Send your custom data to a barcode label printer or download it directly to an Excel spreadsheet using Doran optional Excelerator Data Collection Program. Superior washdown protection has been engineered into the Model 2200 Advanced Weight Indicator. From the heavy gauge stainless steel to the innovative gasket design, the 2200 meets the NEMA4X and IP69K classification for washdown protection. Up to 4 internal mechanical or solid state relays. Up to 8 external mechanical or solid state relays. 15" x 15" 18" x 18" 18" x 24" 24" x 24"
Two configurable Bi-directional RS-232 Serial Ports.